Less than four thousand people turned up to watch Moreirense’s league game against Porto on Friday night. But among those few fans, scouts from several clubs were in the stands, including emissaries from Fulham. The match seemed didn’t seem exciting, with a 0-0 score by halftime. But things got better with the home side opening the scoring in the 79th minutes and Porto finding an equaliser in extra time. With the Dragons not having a great night, not many players impressed. The local media highlights the performances of Iker Casillas, Felipe, Pepe, Alex Telles, Ivan Corona, and of course Hector Herrera, who scored the goal which stopped them from losing. For the home side, striker David Teixeira was the man of the match, while goalkeeper Jonathan had a great night as well. 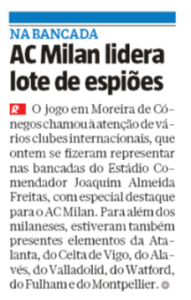 It’s newspaper Record who reports the Whites’ visit to the North of Portugal, but they can’t really say who Fulham had an eye on. Other clubs who had scouts at this match were AC Milan, Atalanta, Celta Vigo, Real Valladolid, Watford and Montpellier.